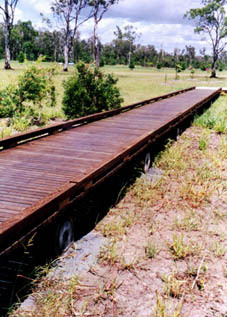 Boardwalk kits can be supplied to a customer’s design using our boardwalk components. (Refer to our Timber Guides › for instructions). Below is a short introduction to the main products. There are over 200 species of eucalyptus milled commercially in Australia. Most are unsuitable for external use because of either high shrinkage with resultant dimensional instability or low durability. Commercial grades for home construction (F14 or F17 of the Australian Standard ›) are unsuitable as these allow a high amount of defect. Weather related degrade is usually associated with existing defects. We produce a high quality decking timber - Deckwood which now allows a client to specify a grade of timber suitable for the application. It is far above the Australian Standard. (Refer to the technical data sheet for sizes, span tables and design details). The first is dressed all round, arrised four edges and treated after machining. Deckwood is available in either 95x45 mm or 145x45 mm. This item is normally used for bridges where the spans are up 2.4 metres. The second, intended for boardwalks with up to 3.0 metre spans is available in 100x100 mm, 100x75 mm and 75x75 mm. These larger timber sizes can be supplied either rough sawn and treated or with a 6mm radius formed on each edge prior to treatment. Joistwood is a grade of Australian Spotted gum suitable for boardwalk joists. It is available in two sizes, 150x75 mm and 200x75 mm. The wide joist allows the builder to stagger the alignment of the 14 gauge screws along its length to avoid damage by the fixings. 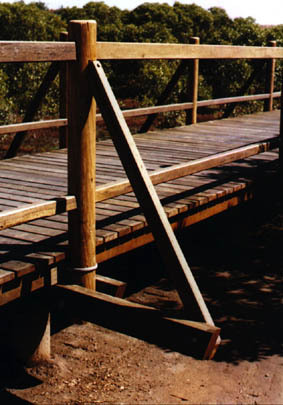 (Refer to the Boardwalk technical information for span charts and information on its use).